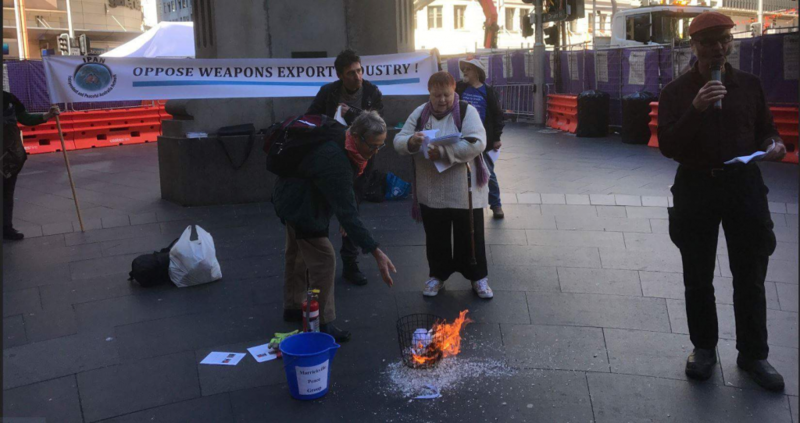 By symbolically destroying the Australian Military Sales Catalogue today, we demonstrate our opposition to the Government spending $3.8 billion our tax money to promote the manufacture and export of weapons of war, that only bring death and misery to overseas countries. The Government’s active promotion of weapons sales must stop. 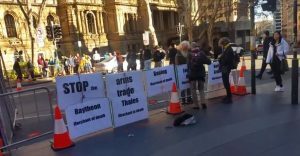 We demand that our government stops building up the weapons export industry, and, instead, builds a more peaceful and caring Australia. 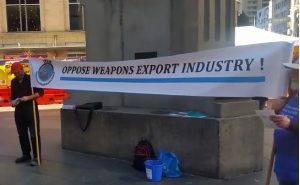 Money is needed for schools, hospitals, housing and pensions – not for weapons exports. What sort of Australia do you want to live in? One which sells weapons to fuel wars and misery in the Middle East? One which seeks peace and cares for people’s basic needs? 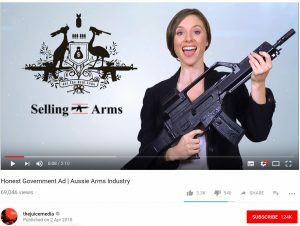 Share The Juice Media’s Pyney’s War House – again and again. People are interested: it has almost 70000 views. People are angry about this. Encourage public destruction of the catalogues in your town.